In 1990, Wendy Kopp founded Teach for America, a scheme that places college graduates as school teachers in some of the poorest communities in the US with the aim of enabling a positive turnaround in children’s expectations and realisations of life success. Throughout the book the author draws on the observations and insights she gained from this programme over the past two decades to offer informed responses to the global problem of educational inequity. Joan Wilson feels that policymakers around the world would do well to sit up and take notice of the key issues it raises. 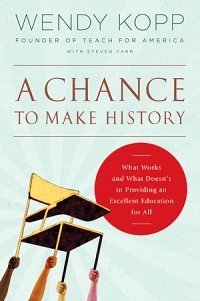 A Chance to Make History: What Works and What Doesn’t in Providing an Excellent Education for All. Wendy Kopp. Highbridge Company. January 2011. How do you solve a problem like educational inequity? A major challenge facing education systems around the world today is how to close the achievement gap that exists between children brought up in poverty and those from wealthier backgrounds and neighbourhoods. In line with the findings of the Coleman report of 1966 – which determined that the largest influence on academic outcomes was socio-economic background – years of education reform in countries like the UK and US have failed to advance the effectiveness of schools in altering the life chances of children from low-income families, a circumstance already set-in-stone for a child before they even reach the school gates. Underlying the Teach for America scheme is the belief that, through high-quality education experiences, schools can and do have an increasing ability to transform the trajectories of children from poorer backgrounds and deliver equal opportunity. One of the key reasons why the education system has been unable to cut the achievement gap in the US and elsewhere is, Kopp believes, because of its failure to operate in the same manner as a highly effective organisation. Like companies, schools need to first establish a clearly defined corporate mission and then to work hard on delivering their set goals. Systemic barriers need to be removed so that schools have the freedom to manage their human capital to their advantage, offering rewards and incentives that enable the recruitment and retention of the most effective talent – both at the leadership and individual teacher level. Equally, schools must have capacities to continually monitor and evaluate the performance of their staff, to provide on-going professional development and chances for career-building, and most importantly, to dismiss employees who underperform. Human capital is not just about personnel – schools must be able to invoke the use of various strategies of learning, assessment, and support to ensure that they deliver on their mission for their students. This means tying together families and children with their local community resources and building the character traits in children than enable them to have raised expectations for their future. All-in-all, across the board system changes are needed in the education sector so that schools can effectively combine strengthened autonomy and flexibility with greater accountability for results as means for reducing educational inequality. Kopp notes that the inability of schools to run like successful companies, and indeed the pervading lack of effectiveness of global education reform, stems from the tendency for policymakers to adopt quick fixes or “silver bullets” to address educational inequity. A whole raft of measures have been introduced to try to close the achievement gap – ranging from increased funding that often does not reach those most in need, to curriculum reform and lengthened school days or years, to structural changes such as class size or school size reduction. Kopp argues that those involved in improving the education system should recognise that without a thorough, long-haul commitment to delivering transformational education and a high quality, well-managed scheme of effective teaching and learning, good policy ideas run the risk of sending “local leaders lurching to attract new resources instead of attending to the long, hard work entailed in building strong organizations” (pp. 133). Thus every type of policy intervention needs to be packaged together with system changes that maximise their potential to work while minimising their capacity to create the wrong incentives. In the UK, outcomes arising from education initiatives of late tally with the view that what is needed is an effectively operating education system with a long-run perspective, clear goals and the right incentives for achieving them. This is most evident in the case of the Academy schools programme – at its inception a scheme that involved restructuring failing schools in low-income areas and granting them more autonomy. Research on early-formed Academies suggests that, due to the pressure to rapidly raise performance, these schools tended to take in pupils of higher prior academic ability than they would have done previously, thus changing their capacity to raise achievement levels of the most disadvantaged students. More recently, conversion into an Academy appears to be driven by the chance to make short-run funding gains rather than to effect long-term beneficial changes to personnel human capital. Due to a lack of whole system change and ineffective implementation of school-level autonomy, the policy runs the risk of looking like a quick fix reform strategy. On the other hand, recent research focusing on the New York City neighbourhood of Harlem has revealed that surrounding children by a continuous organised web of mentoring and support, through education and community-related channels, provides an astonishing means for completely closing the black-white achievement gap in the US. Despite the direct involvement of the author in the Teach for America programme, this book does not represent an unashamed promotion of the scheme as a cure-all for education problems. Instead, the author notes throughout the book that her programme has not, thus far, had the significant impact on education inequity it set out to achieve and it is precisely because of this inside experience that quick fixes are viewed as ineffective if they take place without systemic overhaul. In general, this book provides an enlightening and informative read delivered from the point of view of an author with long-run and valuable knowledge of the US education sector. Policymakers around the world would do well to sit up and take notice of the key issues it raises.